Petit Lagon is a great place for a honeymoon, a family with older children, or two couples who want to enjoy the hillside of Petit Cul de Sac. There are plenty of modern amenities that make Petit Lagon a relaxing place to visit: air-conditioning in all the bedrooms, high-speed internet, screened windows, satellite TV, and more. Outside, there’s a barbecue and a pool for relaxing, sunlit afternoons, and the beach is a short walk away. 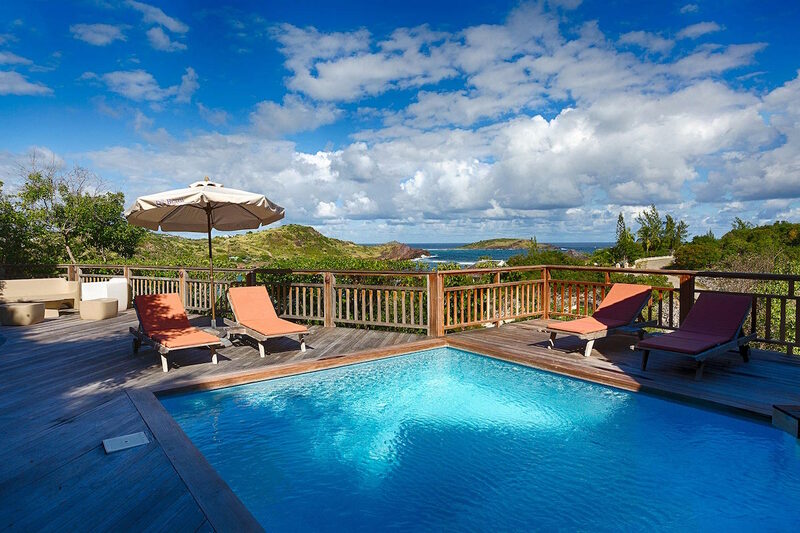 Petit Lagon is a colorful hillside villa with beautiful ocean views. This two-bedroom villa is located a short walk from Petit Cul de Sac Beach. The terrace surrounds the pool, bedrooms, and dining area. Bright pink loungers, a charcoal barbecue grill, and an outdoor living area furnish the terrace. Petit Lagon’s geometric pool faces the sea and sits between the covered terrace and the lounging deck. The covered terrace shades al fresco dining for six, and the house also has beach chairs and the use of two kayaks and two paddle boards, upon request. A bright pink wall in the living room mimics the bright pink loungers on the terrace. The living room opens to the terrace and is furnished with rattan chairs, a flatscreen TV, and a sofa. A small, galley-style kitchen is located next to the living room and is furnished with standard appliances, a blender, a coffee maker, an espresso machine, and an icemaker. Petit Lagon also offers French Satellite TV, WiFi, and high-speed Internet. Both bedrooms have air-conditioning, a king or twin beds, an ensuite bathroom, and access to a private terrace. Petit Lagon comes with housekeeping six days a week, except on holidays. The villa is a two-minute walk from Petit Cul de Sac, a 20-minute drive from town, and 15 minutes from shops.